Sword of Roven is 48 inches in all and weighs 3 pounds 5 ounces. 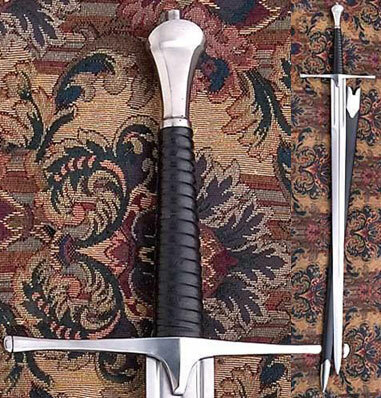 These beautifukky crafted medieval swords are inspired by real swords that were popular circa 1400 that featured a two hand handle. This modern version features a functional 1065 high carbon steel blade that is tempered to a tough spring. The 38 inch blade is 1 7/8th inches wide and 3/16th of an inch thick. The 6 inch wooden grip is wrapped and the wooden scabbard are covered in real leather. The steel accents on the scabbard, the guard and pommel are all polished to a high shine. Buy the popular Sword of Roven for $249.99.